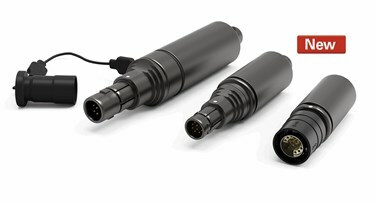 Fisher Connectors offers a rugged, secure flash drive designed specifically for the safe storage of sensitive data in harsh environments. This data drive comes in a portable, miniature, unbreakable design with built-in hanger support, is IP68 sealed (even unmated), extreme temperature resistant, and shock and vibration resistant. They are perfectly adapted for applications where data security and confidentiality are critical, such defense and security, financial, medical, industrial, energy, underwater, motor and extreme sport sectors. This lightweight flash drive includes a unique circular connector interface, and a large selection of body styles, sizes, and contact configurations. This device is high speed USB 2.0 signaling and protocol certified, and has up to 64 GB of memory capacity. The new USB 3.0 version is up to 5 times faster with standard memory sizes of 32, 64, or 128 GB. For more features on the rugged flash drive, download the brochure.